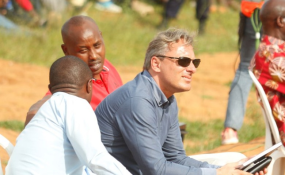 Amavubi head coach Hey (centre) has spent his time in Rwanda, since taking the job, watching league matches as he assesses the national players. The national football team Amavubi head coach Antoine Hey has announced a 25-man provisional squad for the upcoming 2019 CAF Africa Cup of Nations (CAN) qualifier against Central Africa Republic due in Bangui next month. Hey announced the squad in a media briefing held on Thursday afternoon at Ferwafa headquarters in Remera that they are very optimistic to have a very strong team together. "We know now that the players that we have invited are ready physically for the international football and we will have a very tough training schedule especially in the first couple of days and they will be ready for our opening game,"
"We have the quality, physical preparations and now we need to get the players mentally ready for this very difficult match and we will go to Bangui to have a first official successful match on the June 11,"
The 25-man provisional squad has new faces such as veteran defender Aimable Rucogoza from Bugesera FC, right-back Eric Iradukunda from AS Kigali and Gilbert Mugisha from relegated side Pepiniere FC who was the fastest player during the fitness assessment. The professional players are led by skipper Haruna Niyonzima (Young Africans), Gor Mahia duo of midfielder Jean Baptiste Mugiraneza and striker Jacques Tuyisenge, defender Salomon Nirisarike (AFC Tubize), Emery Bayisenge (KAC Kénitra), Slovakia-based trio of Fitina Omborenga, Jean Claude Iranzi and Rachid Kalisa who all feature for MFK Topvar Topoľčany and striker Ernest Sugira who features for Congolese side AS Vita. "As you know, we held the first fitness assessment on May 4 and the results were very mixed. Some of the players were lacking basic fitness to play international level on a certain standard. We gave the players recommendations from our side where and what to improve and gave them three weeks' time to make improvements." "Based on the results of the fitness test, we picked the best 25 players which has nine foreign-based players and they are all expected to come to Kigali later next weekend we will start with the closed camp on Sunday, May 28 evening,"
"We will kick-off official training on Monday next week until Thursday with double training sessions. The morning sessions will be open to supporters and everybody while the afternoon sessions are tactical which will all be behind closed door,"
When asked whether he knows the current state of Central Africa Republic, Coach Antoine said, "We know their style of play, we know their weak spots and we know what to expect,"
Rwanda was drawn in Group H for AFCON 2019 along with Cote d'Ivoire, Guinea and Central African Republic. Amavubi will be looking to qualify for the second time having made its debut in 2004, in Tunisia. Rwanda will face Central Africa Republic on June 11 at Stade Barthelemy Boganda in Bangui. Kick-off has been set at 15H00 local, 14H00 GMT. As Amavubi will be facing Central Africa Republic on June 11, a day before Cote d'Ivoire will host Guinea at Stade de Bouaké in Abidjan. The remaining match days will be staged between March 2018 until November, 2018. The winner of each group alongside the best three second placed teams will qualify for the tournament and hosts Cameroon will also be part of the qualifiers.